The Commonwealth of Pennsylvania was proudly founded by William Penn in 1681. Pennsylvania’s rich history spans five centuries and is woven into the fabric of our nation’s founding. 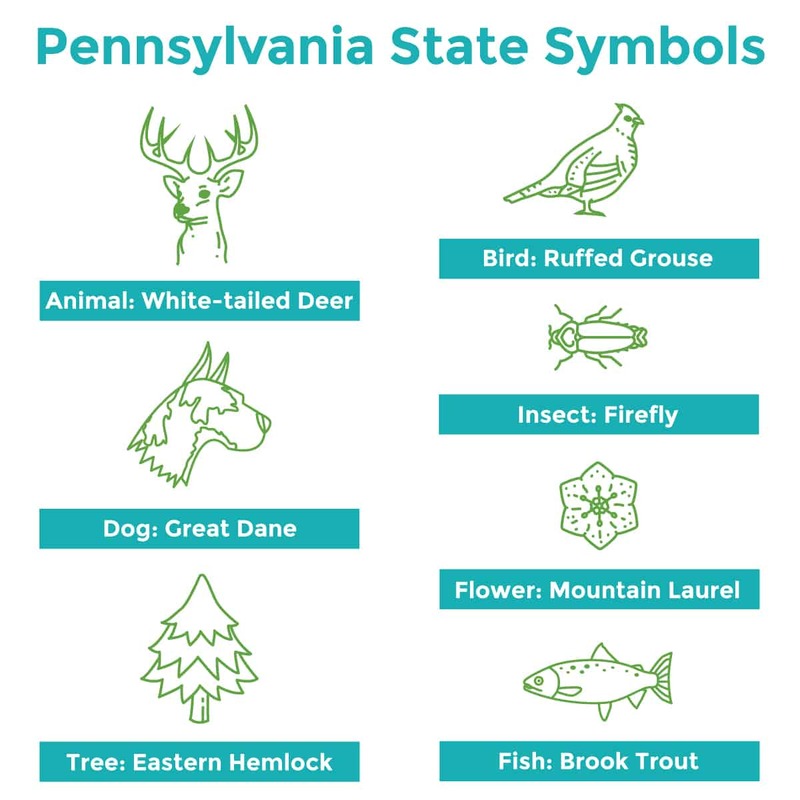 Find out more about the official emblems, symbols, and inventions that have come to represent Pennsylvania. Pennsylvania’s essential role in the founding of the United States earned it the nickname, the “Keystone State.” The term “keystone” comes from architecture and refers to the central, wedge-shaped stone in an arch, which holds all the other stones in place. During the early days of our nation, Pennsylvania held a key position geographically, economically, and politically. Today the keystone is a popular symbol of Pennsylvania — it’s even used as an official symbol of Pennsylvania state government. Each Pennsylvania state agency has its own variation of the keystone as its logo. Pennsylvania’s coat of arms is one of the most familiar of our state emblems. The coat of arms features a shield that shows symbols of Pennsylvania’s strengths — a ship to show state commerce being carried worldwide, a plow to show Pennsylvania’s rich natural resources, and three sheaves of wheat to show fertile fields and Pennsylvania’s wealth of human thought and action. An olive branch and cornstalk also cross beneath the shield — symbols of peace and prosperity. The state motto appears beneath. 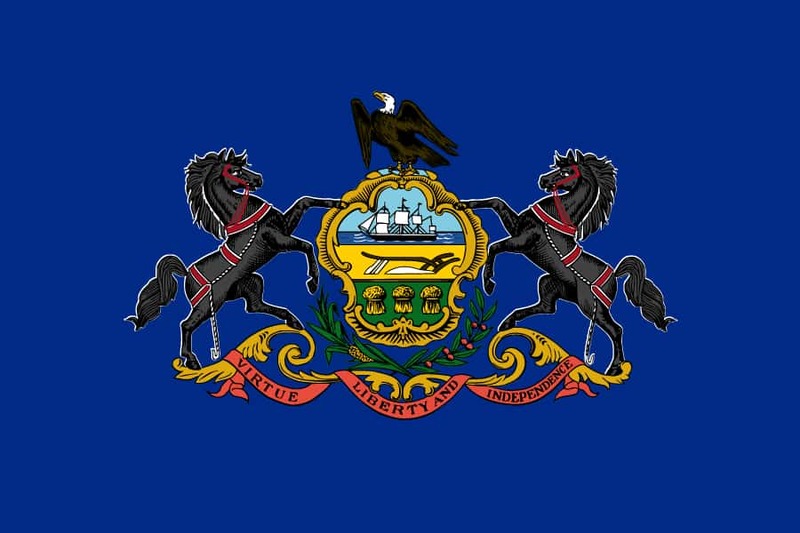 The first state flag of Pennsylvania was authorized by the General Assembly in 1799. Pennsylvania’s flag features the state coat of arms on a field of blue. This brown, chicken-like bird gets its name from the black “ruffs” on the side of its neck. The ruffed grouse was an important part of the food supply for early settlers, and it’s still a familiar sight in Pennsylvania forests today. In frontier Pennsylvania, Great Danes were used as a hunting and working breed. Pennsylvania founder William Penn even had a Great Dane — a portrait of Penn and his Great Dane hangs in the governor’s Reception Room in the Pennsylvania Capitol. Native Americans and settlers alike relied on the white-tailed deer for food and clothing. The white-tailed deer continues to flourish in forests across Pennsylvania. Eastern hemlocks are a common sight in Pennsylvania forests. A slow-growing, long-lived tree, the eastern hemlock can take 250-300 years to reach maturity and may live for 800 years or more. Mountain laurel is an evergreen shrub native to the eastern United States. Its fragrant star-shaped white and pink flowers have attracted travelers since early colonial days. Each spring, Pennsylvania’s mountainsides come alive with the pink blooms of mountain laurel. Brook trout are the only trout species native to Pennsylvania. With a preference for clear and pure water, brook trout are at home in Pennsylvania’s 4,000 miles of cold water streams. Whether you call them fireflies or lightning bugs, these luminous insects brighten Pennsylvania nights all summer long.